This trail travels along the banks of the designated "Wild and Scenic" Selway River and ventures up and out of the river canyon ascending the slopes of Fog Mountain. Fortunately for us, the mountain didn't live up to its foggy name, and we were treated to beautiful view of the "Selway Crags" - jagged peaks in the Selway Mountains. On the way back, we detour a bit further up the Selway River and enjoyed a short hike to Selway Falls. Of the 49 off-highway miles, many were on graded road and about 23 are east to mild 4WD. See a Google Map of this route here. This trip is outlined in the great book, Backcountry Roads - Idaho, by Lynna Howard. Amazing photos by her brother Leland Howard make this book a cross between a trip guise and a "coffee table book". I've made copies of the right pages so I don't have to endanger my copy of this beautiful book. "Idaho's backcountry wilderness is renowned for its stark beauty. Remarkably, some of the state's most beautiful sites are easily accessible for the road traveler that is willing to drive the backcountry logging and forest service roads that few have cataloged. Brother and sister team Lynna and Leland Howard have spent years doing just that. 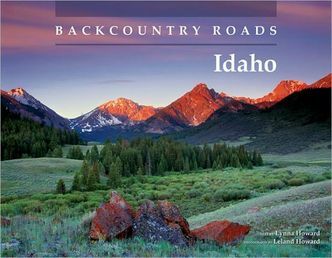 With over 114 photographs, 33 color maps, 31 detailed expeditions complete with GPS coordinates, Backcountry Roads Idaho is an indispensible companion for the road explorer. " Set your GPS to display Degrees and Decimal Minutes. This expedition begins near the town of Lowell, at the confluence of the Selway, Lochsa, and Middle Fork Clearwater rivers. The Lewis & Clark Highway, Highway 12, is a major east-west route that crosses from Lolo, Montana to Walla Walla Walla, Washington. GPS: 46deg 08.569’ N 115deg 35.922’ W Mile 0.0 Elevation: 1,459 ft. Turn east on Selway River Road 223, from Highway 12, just south of Lowell, and north of Wild Goose Campground. A bridge crosses here to the north oside of the Selway River. Highway 12 was not completed through this area until 1962, and the area still has a backcountry feel. Stay on the main road all the way to Fog Mountain Road. At mile 2.9, Swiftwater Road 470 on the right (south) leads to Lookout Butte. At mile 3.9, Johnson Bar Campground entrance is signed. At mile 4.7, Fenn Ranger Station is signed. The building is on the National Register of Historic Places. It was built in the 1930s by the Civilian Conservation corps. At mile 5.1, CCC Campground entrance is signed. GPS: 46deg 05.191’ N 115deg 31.056’ W Mile 7.1 Elevation: 1,542 ft.
Keep straight ahead to stay on Selway River Road at the junction with Road 1542 to Elk City. The O’Hara Campground is across the bridge, on the south side (reservations required). Pavement ends here at O’Hara Creek, and washboards begin. The gravel/dirt road is heavily traveled by river runners and other visitors. The road also narrows here. Drive carefully. Traffic from numerous campgrounds enters the main road. At mile 8.3, Rackliff Campground. At mile 9.7, Twentymile Bar Campground. At mile 10.6, Slide Creek Campground. At mile 11.1, Boyd Creek Campground, and the western end of the Boyd-Glover Roundtop National Recreation Trail. At mile 14.7, Twentyfive Mile Bar Campground. At mile 15.6, Glover Campground. GPS: 46deg 03.232’ N 115deg 18.540’ W Mile 18.6 Elevetion: 1,725 ft. Turn sharply left, northwest (greater than 90deg turn) on Fog Mountain Road 319.. The road is signed for Big Fog Saddle. In winter months administrators use a gate to close this road. Fog Mountain Junction Campground is 0.2 mile up this road. This 4WD road climbs steeply, is narrow and has few turnouts. If the road is wet, 4WD experience is required. When we were there the lower half was graded, washouts had been rocked over, and brush was cut back; but the upper half was still rocky, rutted, and narrowed by encroaching brush. At mile 24.8, the trailhead for Trail 725 is on the left (north) leading to Gedney Creek. Fog Mountain Saddle is at mile 25.1. GPS: 46deg 05.555’ N 115deg 14.324’ W Mile 27.1 Elevation:6,430 ft.
Fog Mountain. A spur road leads east to a Lookout (it is not signed). This is the best informal campsite on Fog Mountain Road, and is offers the best views of The Crags (also known as “Selway Crags”), a subrange of the Clearwater Mountains. The Crags have a distinctive, serrated outline reminiscent of The Bighorn Crags in the Frank Church Wilderness. Chimney Peak is the highest, at 7,840 feet, which is quite dramatic when you consider that most of the Clearwater Mountains roll up to 6,000 foot forested tops. Alpine lakes dot The Crags area. If you plan to hike or backpack here, you will need the Selway-bitterroot Wilderness map. Campgrounds along the Selway River were full when we were there, but we saw no one on Fog Mountain. Well, we saw no humans. We did see forest grouse (“fool hens”) eating overripe thimbleberries and reeling drunkenly along the roadside. Wild turkeys were abundant, as were deer. From this viewpoint, the road descends to Big Fog Saddle at mile 29.8. GPS: 46deg 06.898’ N 115deg 12.341’ W Mile 30.0 Elevation: 5,863 ft. The end of this expedition is at the end of Fog Mountain Road 319. Just beyond Big Fog Saddle is a trailhead for three trails into the Selway-Bitterroot Wilderness: Trail 31 to Cove Lakes, and into The Crags; Trail 343 to Big Fog Mountain and beyond; and Big Rock Trail 693 to Moose Meadows, with a loop to Trail 343. Big Fog Mountain Trailhead is set up to accommodate horsemen, with hitching rails and loading ramps (all this in spite of the fact that the access road is signed “no trailers”). Retrace your route, returning to Selway River Road. From the intersection of Fog Mountain Road and Selway River Road, we recommend a short drive to the end of Selway River Road. Turn east and drive 0.5 miles to a “Y” intersections where you have a choice of taking the right fork (Road 290) to Selway Falls Campground and Meadow Creek National Recreation Trail; or take the left fork and continue to Race Track Campground (mile 0.8), to Race Creek Campground (mile 1.5) and to the end of Selway Rivers Road 223. From the end of the road, the hike along the Selway River is one-of-a-kind beautiful. A river that runs free, with no dams, and on which river traffic is limited, feels and looks different. Sandbars and natural wetlands enhance the shore. The hiking trail leads to the wilderness border in about 0.6 mile, and almost level walk. Backtrack toward Highway 12.